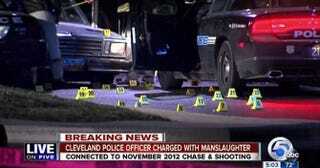 A grand jury has indicted six Cleveland police officers in the deaths of two unarmed suspects, who were killed in a spray of 137 bullets after a wild car chase that ended in a schoolyard, the Associated Press reports. The indictment on Friday is part of a far-reaching federal investigation into “the Cleveland Police Department’s use of deadly force and its pursuit policies,” the AP reports. Since both suspects were black, the specter of racism hovers over the case and represents a major part of a federal investigation into the department, the AP says. Timothy Russell, the driver, was shot 23 times, and Malissa Williams, the passenger, was shot 24 times. No guns were found in their possession or inside the vehicle, the AP reports. McGinty said the shootings occurred after the suspects had been subdued and the public safety threat was over, the AP says. The incident involved five dozen cruisers and raced through residential neighborhoods, onto Interstate 90 and eventually ended in East Cleveland, the AP says. McGinty said the chase covered 20 miles over 23 minutes and reached speeds of 110 mph. Capt. Brian Betley, the leader of the Fraternal Order of Police, which represents police supervisors, told the (Cleveland) Plain Dealer that he was disappointed in the grand jury's findings. Read the entire story at MSN.